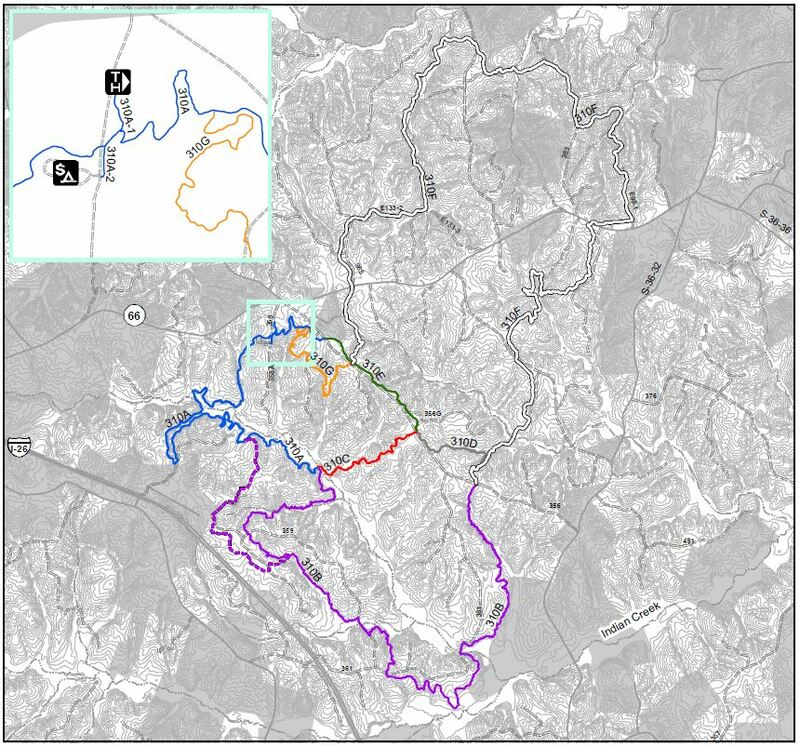 The Buncombe Horse Trail winds through forested hill and valley terrain. Points of interest include old cemeteries, wagon roads and old home sites. Wildflowers dot the landscape. Opportunities also exist to view various wildlife species such as deer and turkey. With interconnecting loops, riders have an opportunity for rides of varying lengths. The entire family can enjoy this trail as it’s a leisurely ride that can be negotiated easily. Brick House Camp: 23 single family sites. All sites are first-come, first-served. Campsites have leveled designated parking pad, picnic table, lantern holder and a rock fire ring. Horses may be highlined behind the designated white banded trees around the perimeter of the campground. Two vault toilets are centrally located to each end or the campground. There is “NO WATER OR ELECTRICAL HOOK-UPS” available. There is a fee for camping, paid at the campground kiosk. Fee: $3/day/vehicle or $25/year for the forest seasonal pass/vehicle for trail use. From SC Route 66 (3.5 miles east of I-26) turn south onto Forest Service Road 358. Trailhead parking is on the left side of the road. The Brick House Campground is .3 mile further south on the right.